The 24-hour emergency hotline number for reporting all environmental incidents relating to air, land and water in England, Wales, Scotland and Northern Ireland. The website of the Civil Contingencies Secretariat in the Cabinet Office. It provides links to government and non-government sources on a wide variety of emergencies and crises that can affect the UK, plus emergency planning guidance and government information. Too many people die each year in the UK from Carbon Monoxide poisoning and many become chronically ill. With symptoms including headaches and drowsiness, it’s often confused with flu. Gas stoves, fires and boilers, gas powered water heaters, paraffin heaters, solid fuel powered stoves, boilers and water heaters are all capable of producing Carbon Monoxide if not appropriately installed and maintained. Carbon Monoxide can seep into properties via shared flues and chimneys and people may be poisoned by Carbon Monoxide produced next door. That is why it is important to ensure your appliances are working properly and that as a second line of defence you have an audible Carbon Monoxide alarm installed. We all carry our mobile phones with hundreds of names/ numbers stored in its memory but yet nobody, other than ourselves, know which of these numbers belong to our near and dear ones? In case we are involved in an accident or had a heart attack and the people attending us get hold of our mobile phone but don't know which number to call to inform our family members. Yes, there are many numbers stored but which one is the contact person in case of an emergency? For this reason, we must have one or more telephone numbers stored under the name ICE (In case of Emergency) in our mobile phones. Recently, the concept of "ICE" is catching up quickly. It is simple, an important method of contact during emergency situations. As cell phones are carried by majority of the population, just store the number of a contact person or person who should be contacted at during emergency as ICE" (meaning In Case of Emergency). The idea was thought up by a paramedic who found that when they went to the scenes of accidents, there were always mobile phones with patients, but they didn't know which number to call. He therefore thought that it would be a good idea if there was a nationally recognized name for this purpose. Following a disaster in London, the East Anglican Ambulance Service has launched a national "In case of Emergency (ICE)" campaign. In an emergency situation, Emergency Service personnel and hospital staff would then be able to quickly contact your next of kin, by simply dialling the number stored as "ICE". It really could save your life, or put a loved one's mind at rest. For more than one contact name simply enter ICE1, ICE2 and ICE3 etc. The National Mobile Phone Register holds details of over 10 million mobile phones and the number is growing all the time as more folk sign up. Get signed up for FREE and you can block your phone if it is lost or stolen. Go to www.immobilise.com/ Police forces in the UK are supporting this campaign. New legislation being introduced on 27 February 2007 stipulates that it is illegal to use hand-held mobile phones when driving, when stopped at traffic lights or when queuing in traffic and the penalties for doing so are now more severe. Mobile phones have many benefits, for example they can be a great help in an emergency, but recent tests (1) have shown that a driver cannot help being distracted by a phone call or text message when driving. If distracted, drivers will not register hazards or react quickly enough in any given situation. Michael McDonnell, Director of Road Safety Scotland, said: "The number of accidents involving the use of mobile phones is on the increase. It is unnecessary to use a mobile phone while driving- not only are you putting yourself at risk, but you are putting other road users at risk. Just switch off your mobile or even divert calls to your answering machine before you set off on your journey." Drivers caught using a hand-held mobile phone while driving will receive a £60 fine and three penalty points on their licence. This could mean loss of license for some. Points on your licence may mean higher insurance costs. If the case goes to court drivers risk up to a maximum of £1,000 fine (£2,500 for drivers of vans, lorries, buses and coaches). Employers that require employees to make or receive calls while driving can be prosecuted. You can also be prosecuted for using a hands-free mobile phone if you are not in proper control of your vehicle. The penalties are the same as using a hands-held phone. Driving carelessly and dangerously when using any phone can lead to disqualification, a large fine and up to two years imprisonment. A conversation on a hands-free phone is no less distracting than using a hand-held one. NORTHERN Constabulary’s promise to catch as many drink drivers as possible was underlined this week as the Force detected more offenders than in any of the three previous weeks of the Festive Safety Campaign. A total of 23 drink drivers were detected during week four of the campaign, up from 13 for the same week in 2005. One drug driver was also detected, making it a total of five drug drivers since the Force’s campaign, labelled Enjoy It Don’t Destroy It, began a month ago. During the entire four week campaign Northern Constabulary detected a total of 75 drink drivers across the Highlands and Islands, compared to 61 for the same period last year. Five drug drivers were detected during the four weeks, compared to none last year. The public’s patience appears to have run out in relation to drink and drug drivers with many of the offenders being reported by the public throughout the campaign. Pleasingly for Police, members of the public are also calling Crimestoppers with information in relation to drink and drug drivers anonymously. During the campaign the public reported 11 suspected drink drivers and 2 suspected drug drivers to the crime fighting charity. As a direct result of these calls two people were arrested in connection with alleged drink driving offences. Inspector John Smith of Northern Constabulary’s Road Policing Section said: “Despite the warnings of the consequences of drink and drug driving certain individual motorists have chosen to put the lives of other road users at risk without a second thought. “The general public clearly support the Police in relation to drink driving enforcement and this is evidenced by the backing that Northern Constabulary has enjoyed throughout the campaign. He added: “As promised the Force increased patrols throughout the festive period and this has contributed to the rise in the number of motorists arrested in relation to this most serious offence. NORTHERN Constabulary raised concern this week as the number of people involved in collisions during the first week of the Festive Safety Campaign as a result of drink driving rose compared to the same period last year. The Force detected 10 drink drivers across the Force area after they had all been involved in a road collision, compared to six during week one last year. The number of positive breath tests in non-collisions dropped. Six were detected during the first week, compared to 11 the previous year. In total 16 people were found to be over the limit during week one, a drop of two on last year. The Force launched its annual Festive Safety Campaign last week and the message to drivers over the festive period is crystal clear - Enjoy It Don’t Destroy It. The campaign is also focusing on drug drivers. There were no drug drivers detected during the first week this year. The same campaign in 2004/05 saw 54 drivers test positive for drink whilst driving across the Northern Constabulary Force area and two people reported for drug driving offences. Inspector John Smith of Northern Constabulary’s Road Policing Section said: “Although we have seen a slight drop in offences compared to last year it is clear the message is still not getting through to drivers and that is shown in the rise of collisions involving drink. “Those who believe they will never be caught and it won’t happen to them are kidding themselves. We are treating this issue extremely seriously and will continue to track down those we believe may be putting themselves and other road users at risk. Figures will be provided by Media Services throughout the campaign on a weekly basis. Saturday 9 December – 20-year-old male crashed into a petrol station on the A82 in the Glencoe demolishing a diesel pump. Found to be more than twice the legal limit and detained overnight for court. Subsequently fined £1000 and disqualified from driving for 18 months and required to re-sit test. FOR FURTHER INFORMATION PLEASE CONTACT MEDIA SERVICES ON 01463 720396. NORTHERN Constabulary has launched its annual Festive Safety Campaign and warned those who drink and drive they stand more chance than ever of being caught. The number of drivers continuing to flout the drink drive law across the Highlands and Islands is completely unacceptable and Northern Constabulary is urging people to ensure their Christmas is one to remember for the right reasons. The Force will be carrying out intelligence-led patrols and will be out in numbers across the Festive period to detect drink drivers, as well as those taking part in the equally dangerous practice of drug driving. Another part of the Festive Safety Campaign, labelled Enjoy It Don’t Destroy It, will include a crackdown on those not wearing seatbelts. The four week campaign in 2005/06 saw 61 drivers test positive for drink driving across the Northern Constabulary Force area, an increase of seven on the previous year. During last year’s campaign 10 of the 12 people detected during the final week of last year’s campaign were reported by members of the public. Inspector John Smith of Northern Constabulary’s Road Policing Section said: “The Festive Safety Campaign ties in with one of the Force’s key strategic outcomes in making roads within Northern Constabulary Force area safer, with reduced deaths, injury and crime. “I would urge the public to respond positively to our message, not just at this time of year but throughout the year. Inspector Smith added: “We would encourage people to report drivers they believe may be under the influence of alcohol or drugs. “We have had instances in the past when friends or family members have reported people close to them after suspecting they may be driving under the influence of a particular substance. “Drivers are well aware of the risks they are taking and if you don’t know what the legal limit is don’t drink at all. THE officer leading the inquiry into the murder of Nairn banker Alistair Wilson today made a fresh appeal to anyone with information about the crime to have the moral courage to come forward. DCI Peter MacPhee spoke at a press conference earlier today to mark the second anniversary of the murder of the 30-year-old father of two. Alistair Wilson was shot dead on the doorstep of his family home in Nairn’s Crescent Road on 28 November 2004 and to this day Police say there is still no apparent motive for the shocking murder. Mr Wilson’s widow Veronica also appeared at today’s press conference, which was held at the Newton Hotel in Nairn. She made another heartfelt appeal for information leading to the arrest of her husband’s killer. DCI MacPhee said: “This case has, quite rightly, attracted a very high profile in the media, and I am grateful for the media involvement which has informed the public at various stages of the investigation. “I remain convinced that there is someone out there who could hold the key to the killer’s identity. DCI MacPhee said that the Police’s thoughts once again go out to the Wilson family, who have not only had to come to terms with their tragic loss without knowing who killed Alistair, but have had to endure all the pressures and challenges that such harrowing events bring. Despite the largest enquiry conducted in the Force area in recent years Alistair’s murder remains unsolved, however, the scale of inquiries into his murder cannot be underestimated. All these figures are as of 23.11.06. DCI MacPhee would like to take this opportunity to recognise the extensive work which has been carried out by all those involved in the enquiry, particularly those who have been dedicated to it for the past two years. From the outset Northern Constabulary has sought advice and assistance from outwith the Force in several specialist areas, and a number of experts from a range of disciplines have contributed to the overall investigative strategy. The Force has used the experience of the Grampian Police Forensic Science Lab and Strathclyde Police Ballistic Department. Examinations have also been carried out at a further eleven labs in the UK. The entire forensic strategy has been independently overseen by a Forensic Advisor from Centrex (the national centre for Policing excellence). Other experts in specialist areas have been called upon including behavioural advisors, geographic profilers, forensic accountants, psychologists as well as some of the country’s most experienced Senior Investigating Officers. Anyone who has information in relation to this murder is asked to contact Northern Constabulary on 01463 715555 or call Crimestoppers 24-7 anonymously 0800 555 111. NORTHERN Constabulary has vowed to continue its crackdown on alcohol related violence as the latest phase of the Safer Scotland campaign to reduce violent behaviour across the country draws to a close. This phase, which followed the crackdown on knife crime, focused on the effects alcohol has on the safety of our communities. The aims of the campaign were to reduce the availability of alcohol to people under 18, provide reassurance to communities experiencing anti-social behaviour and raise awareness of the issue of the purchase of alcohol by others on behalf of youngsters. During the five-week campaign more than 285 litres of alcohol has been seized from youngsters and street drinkers and 449 visits have been made by Police to off-sales premises. Four alleged offences were detected at off-sales premises during the campaign. Within the Northern force area nine people were charged in relation to the alleged purchase of alcohol for people under the age of 18 and two people under 18 were charged in respect of purchasing or attempting to purchase alcohol. There were 21 under-18 males detected drinking in public places and 15 females under 18. There were also 37 men, aged over 18, detected committing drinking in public offences and six females over 18. There is a clear link between the misuse of alcohol and violence and Northern Constabulary has been using this campaign to also educate licensees and shop staff on their responsibilities when selling alcohol as well as targeting groups of youths attempting to buy or drinking alcohol. During the latest phase Police increased visibility and patrols across the Force area, especially at places where people were known to congregate and at times when excessive drinking was more likely to take place, such as Friday and Saturday nights. The campaign took place in two distinct stages, the first concentrating on youths using alcohol and people drinking in public places (4 – 17 September) and the second on people buying alcohol for youngsters and employees of licensed premises selling alcohol to minors (18 Sept – 1 October). Chief Inspector Ian Arnott, the officer co-ordinating the Force’s participation in the Safer Scotland campaign, said: “Drink and violence go hand in hand and Police have been adopting a pro-active stance in their attempts to reduce drink related violence throughout this campaign and will continue. “We were of course also focusing strongly on those who purchase alcohol for youngsters and disappointingly nine people were detected committing this offence. He added: “Northern Constabulary will continue to work towards maintaining a safe community. We welcome the assistance given by the community and licensees and their staff during this campaign. “We continue to encourage anyone to provide us with information about violence or the illegal sale or supply of alcohol. NORTHERN Constabulary will join Scotland’s other Police forces in the latest phase of the Safer Scotland campaign to reduce violent behaviour across the country. This phase, which follows the crackdown on knife crime, focuses on the effects of alcohol on community safety. The aims of the campaign include reducing the availability of alcohol to people under 18, providing reassurance to communities experiencing anti-social behaviour and raising awareness of the issue of the purchase of alcohol by others on behalf of youngsters. Due to the link that exists between misuse of alcohol and violence, Northern Constabulary will continue its focus on violence by also focusing on those who break the alcohol by-laws by drinking in the streets. Measures will include increased visibility and patrols across the Force area, especially at places where people are known to congregate and at times when excessive drinking is more likely to take place such as Friday and Saturday nights. Officers will also increase regular visits to licensed premises to deter potential offenders. This campaign will take place in two distinct stages, the first concentrating on youths using alchol and people drinking in public places (4 – 17 September) and the second on people buying alcohol for youngsters and employees of licensed premises selling alcohol to minors (18 Sept – 1 October). Police will carry out high visibility patrols across the Force and make use of CCTV which is available in many towns across the Force area. Chief Inspector Ian Arnott, Northern Constabulary’s Safer Scotland co-ordinator, said: “There is a clear link between alcohol misuse by youngsters under 18 and anti-social behaviour and this phase of the campaign will focus on that aspect as well as other issues related to this theme. “We recognise that only a minority of people commit these type of offences and that the majority deserve the protection this operation is intended to deliver. I would encourage the public to contact us if they have information about the sale of alcohol to young people. Alternatively please use the Crimestoppers telephone number – 0800 555111 to pass information to us. “Drink and violence go hand in hand and Police will be adopting a pro-active stance in their attempts to reduce drink related violence throughout this campaign and beyond. FOR FURTHER INFORMATION PLEASE CONTACT MEDIA SERVICES ON 01463 720396/7. 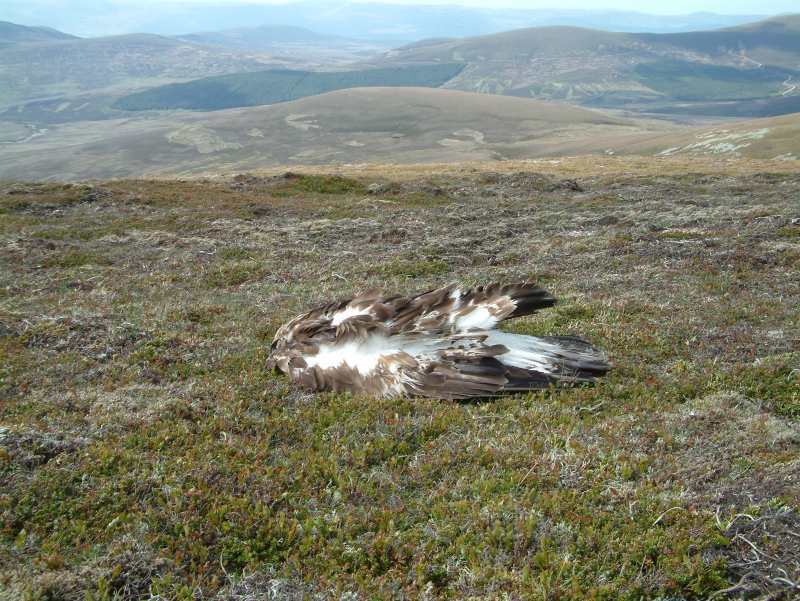 FOR the first time in its history RSPB Scotland is offering a reward for information which leads to the arrest and conviction of the person(s) responsible for the poisoning of two protected golden eagles. Northern Constabulary is currently carrying out inquiries into the poisoning of one of the birds of prey at the Glenfeshie Estate in the Cairngorms on June 10. Meanwhile Grampian Police is carrying out a similar inquiry following the death of another golden eagle at Dinnet and Kinnord Estate near Ballater on 13 May. These crimes have caused great concern for RSPB Scotland officials and as a result the organisation has decided to put up a reward of £1000 per crime for information which leads to the arrest and conviction of those responsible. It is the first time the organisation has offered a financial reward for information in relation to the death of a bird, but it hopes this move will highlight the serious nature of this type of crime, as well as underlining the RSPB Scotland and Police’s determination to detect those responsible and bring them to justice. It is understood that both birds were poisoned using illegal carbofuran poison. Possession of this substance is in itself a crime. PC John Bryden, Wildlife Crime officer at Northern Constabulary, said: “The Force takes any type of crime against wildlife very seriously and we are continuing our inquiries into this incident. Grampian Police, which now has a full-time Wildlife Officer in PC Dave McKinnon, is also appealing for information in relation to the poisoning of a golden eagle on the Dinnet and Kinnord Estate near Ballater. PC McKinnon said: “We look forward to developing our partnership with the RSPB Scotland in relation to what is a very serious offence. Stuart Housden, Director of RSPB Scotland, said: “Golden eagles are magnificent icons of the Scottish uplands and we should be proud that Scotland supports some 442 pairs of these awe inspiring birds that attract tourists from all over the world. Yet some in our country selfishly persecute these birds, through the use of poisoned baits or other means. Police would encourage members of the public who find a dead bird or a carcass, which they suspect may have been left there for bait, not to touch anything and report their finding to Police. Officers would also ask the public to inform Police only and avoid touching the area as potential evidence may be destroyed. PC Bryden added: “Poison such as carbofuran is extremely dangerous to humans and pets and we would urge people who find carcasses not to touch them and contact Police immediately. Anyone with any information about either crime is asked to contact Northern Constabulary on 01463 715555, Grampian Police on 0845 600 5700. Alternatively contact Crimestoppers 24-7 anonymously on 0800 555 111 or The Campaign Against Illegal Poisoning number which is 0800 321 600. NORTHERN Constabulary officers in Inverness Area Command have seized drugs with an estimated street value of £50,000. The seizure of suspected cocaine and amphetamine was made during an operation yesterday evening (Wednesday 9 August 2006) in the Ardersier area. Five men (36, 37, 38, 39 and 43) and a 38-year-old woman are expected to appear at Inverness Sheriff Court tomorrow in connection with offences relating to the supply of illegal drugs. Detective Superintendent Gordon Urquhart said: “One of the Force’s strategic priorities is to stem the supply of illegal drugs to the Highlands and Islands. These latest seizures underline the Force’s determination to make a significant impact against drug dealing. Police would urge anyone who has information about people they suspect may be involved in drug related activity to contact us or call Crimestoppers anonymously on 0800 555 111. NORTHERN Constabulary has said it is pleased with the results of the Safer Scotland Knife Amnesty after 504 blades were handed in during the month long campaign. Although the figures are relatively low compared to other areas of Scotland, Chief Inspector Ian Arnott urged people to continue to report anyone they believe may be in possession of a bladed weapon. The types of weapons handed in at Police stations across the Highlands and Islands included kitchen knives, non-domestic knives, swords and other weapons. The national knife amnesty saw over 12,000 weapons handed in as the public responded positively to the Scottish Executive led campaign. Chief Inspector Ian Arnott, the officer co-ordinating the Safer Scotland campaign for Northern Constabulary, said: “Whilst there were relatively low numbers of knives handed in across the Highlands and Islands compared to other areas of Scotland it is obviously concerning that these weapons were out there in the first place. “I would ask the public for their continued assistance and to report anyone they suspect may be carrying a weapon. In May the Lord Advocate, Colin Boyd QC set out tough new measures for combating knife crime. Today marks the end of the knife amnesty, which commenced on 24 May. During the amnesty a number of knives and weapons were recovered from the red bins that were placed throughout Highland and Islands. These weapons will now be destroyed. Figures on the number of weapons handed in during the amnesty will be issued centrally by the Violence Reduction Unit. Despite the fact that knife crime is not as prevalent as in other areas of Scotland the Force was pleased with the response by the public to the amnesty. Northern Constabulary is taking part in the national Safer Scotland campaign, being co-ordinated by the Scottish Executive’s new Violence Reduction Unit. Due to the link that exists between misuse of alcohol and violence, Northern Constabulary will continue its crackdown on violence by focusing on those who break the alcohol by-laws by drinking in the streets. Measures will include increased visibility and patrols across the Force area, especially at those times when excessive drinking is more likely to take place such as Friday and Saturday nights. Andrew Laing, Area Procurator Fiscal, said: “The Police and Procurator Fiscal Service have listened to our communities who have told us that we should prioritise the response to violence. “We are committed to serving our communities by doing what we can to reduce violence upon members of the public. The officer co-ordinating Northern Constabulary’s involvement in the latest Safer Scotland campaign, Chief Inspector Ian Arnott, said: “Alcohol related violence is certainly something which gives Police in the Highlands and Islands cause for concern. “We also realise that with the World Cup in progress over the summer the amount of alcohol likely to be consumed will increase and we will look to have the necessary resources available during peak times. Stuart Rattray was convicted of carrying a knife and attempted robbery of Inverness shopkeepers. He received a sentence of 10 years extended sentence at Glasgow High Court on 14 June 2006. The sentence was backdated to 18.2.06. THE Northern Safety Camera Partnership is appealing to the public to reduce their speed on the roads of the Highlands after figures released today show that a number of drivers are breaking limits by 10mph or more. The Northern Safety Camera Partnership took part in a recent Speed Monitoring Survey and it revealed that significant numbers of motorists across the Highlands exceed the speed limit by 10 mph or more. Inspector Derrick Cronie, Project Manager for the Northern Safety Camera Partnership, said: “Driving at excessive speed is a contributory factor in many collisions and with the tourist season bringing an increase in traffic, continuing to drive at such speeds will almost inevitably lead to further collisions. The survey was conducted over a two week period at the 29 sites operated by the Northern Safety Camera Partnership. Speeds of up to 100mph were detected at some locations but all 29 sites showed significant numbers driving at 10mph over the national speed limit. the country." Mr Latimer said: "I am delighted at this extension to my contract as I enjoy living and working in the Highlands and my family is settled here. I'm a great believer in continuity of service and this new contract will allow me to continue with my plans for this, the best performing force in Scotland." During Mr Latimer's term as chief constable, the number of officers on the beat has increased from 661 to 707 - the highest ever. He added: "It is my intention to further build on these numbers and continue to drive down crime figures, retain detection rate levels and ensure our force area remains one of the safest places to live, work and invest." The Highland and Islands Fire Board has appointed a new Deputy Chief Fire Officer. He is Mr Tony Wood, a senior divisional officer with Merseyside Fire and Rescue Service. Mr Wood is Director of Human Resources and Lead Officer on Integrated Risk Management Planning with the Merseyside Fire and Rescue Service, being a member of their strategic corporate leadership team. He will take up his new duties in the early summer and will be joined by his family at the end of the school year. Councillor Drew McFarlane Slack, Convener of the Highland and Islands Fire Board, welcomed Mr Wood's appointment. He said: "Merseyside is one of England and Wales' highest performing fire and rescue services. Mr Wood's experience and abilities will add to the existing excellent management team we have in the Highlands and Islands." NORTHERN Constabulary is warning those who continue to flout the laws governing speeding and the wearing of seatbelts that enforcement will continue. Drivers in the Highlands and Islands were yesterday asked to belt up and slow down as part of a new national seatbelt and speeding enforcement day. High visibility patrols took to the streets yesterday (Monday 24 April 2006) targeting drivers whom were either speeding or not wearing seatbelts. Across the Force yesterday 28 drivers were detected not wearing seatbelts as well as four front seat passengers, one rear seat passenger and one child in a rear seat. On the speeding front 30 drivers were detected breaking the speed limit in built-up areas with five in non-built up areas. These were all detected by officers. The Northern Safety Camera Partnership also detected another 34 drivers breaking the limit in non-built up areas. Road Policing Inspector John Smith said: “Despite warnings to the public regarding both speeding and the non-wearing of seatbelts it is disappointing to see so many people not complying with the law. Motorists putting lives at risk in their own vehicles or on the roads were being warned not to risk it. All eight Scottish Police forces took part in today’s Speeding Seatbelt Awareness Day, which was been organised by ACPOS (Association of Chief Police Officers Scotland). It is the first of four days planned between now and February 2007. Northern Constabulary’s Road Policing Section, along with specially trained community Police officers, were on the look out for drivers going over the speed limit or not fastening their seatbelts. As the number of licensed motorcycle bikes in Scotland and the Highlands increases year by year, so does the number of accidents involving motorcyclists. Reducing casualties is the key concern of a motorcycling safety seminar to be held on Monday 24 April at Highland Council Headquarters in Inverness. Northern Constabulary and The Highland Council have jointly organised the day-long seminar to highlight the extent of the problem and to look at practical ways on how, by working in partnership, they can reduce the statistics. Delegates will hear presentations on a variety of road safety issues, including education, engineering, partnership working and other issues relating to safety and examining changes to the Motorcycle Test in 2008. There will also be information about schemes already in place across the Highlands and Islands, such as Bike Safe and Bike Aid. In Scotland, a total of 986 motorcyclists were injured in road accidents in 2004. This represents 5% of all casualties. Of these, 348 were seriously injured and 41 died. Three fifths of those killed or seriously injured occurred on non-built up/rural roads. In Highland, in 2004, there were 32 fatalities, 6 of these were motorcycle fatalities. Northern Constabulary Road Safety Officer, Laura Fisher, said: "One of the Force's strategic priorities is to reduce serious and fatal casualties on the roads of the Highlands and Islands and this conference is all about promoting safer motorcycling to all riders, clubs and associated bike users. "Some of the messages which will be conveyed to delegates will hopefully go some way to preventing future motorcycle tragedies on our roads." The Governments Road Safety Strategy ~Tomorrow's Roads: safer for everyone~ sets out casualty reduction targets for 2010. The targets include achieving a ~40% reduction in the number of people killed or seriously injured~ on our roads and a "10% reduction in the slight casualty rate" compared with the 1994 - 1998 average benchmark. The Highland Council's Road Safety Officer, Lisa MacKellaich said: "In general, progress towards these targets in Scotland and Highland has been excellent. However over recent years the number of motorcycle casualties both locally and nationally has been increasing. "This Motorcycle Safety Seminar is one part of a programme dedicated to bringing these figures down. We as a Council have put funding towards both the Bike Safe and Bike Aid Programmes. Bike Safe is an initiative run by Northern Constabulary who work with the whole of the biking world to help to lower the number of motorcycle rider casualties by passing on their knowledge, skills and experience. Bike Aid is run alongside Bike Safe in Highland Council Area and is a First Aid course designed for Motorcyclists delivered by the Scottish Ambulance Service." Thurso lifeboat, The Taylors was out on a routine exercise and still managed to help out a boat in trouble. Local boat Puffin had engine failure and the lifeboat was able to give her a tow back to Scrabster. From 1st January 2005, there will be some changes to health services in the Caithness area when your GP Surgery is closed. Until that time, you should continue to contact your GP’s existing Out of Hours service. Please note that these changes do not apply to patients of the GP in Dunbeath, who will continue to be covered by their own GP surgery. For a life threatening emergency you should still call 999. This is unchanged. If you need health advice or care when your GP surgery is closed call NHS24 on 08454 24 24 24 – the care you need is a phone call away. Police in Caithness have joined forces with the Local Authority Housing Department and Pulteneytown People's Project to combat vandalism in the area. Under the auspices of the recently formed Caithness Vandalism Action Group, partners have committed to a high profile operation in the upper Pulteneytown area of Wick. "The initiative code named "Operation Values" although chiefly combating vandalism, is anticipated to attract information in relation to other issues such as antisocial behaviour, crimes of dishonesty and drug related offences" said local Area Commander Chief Inspector John MacDonald. New Thurso Lifeboat Arrives At Scrabster - "The Taylors"
the new Thurso lifeboat has arrived home. The boat was crewed by the coxswain and mechanic plus three crew members who travelled to Poole in Dorset to do a week of training before taking the boat home. The boat cost £1.9m. The boat is one of the Severn class of lifeboats, 17m in length with a maximum speed of 25Kts. She is named THE TAYLORS after a family of that name from Aberdeen who left a legacy to the RNLI. Wick Airport firemen train weekly on a simulator enabling them to tackle a wide range of fires and situations as near to real life as possible.